Tent design and fabric technology have come along way from the waxed canvas pup tents of my boyhood. This entry shares my approach to and experience with “comfort light” shelters. There are many choices of very light solo and two person tents from major suppliers and a lot of cottage manufacturers. The lines blur when tents start to become only shelters, like tarps or even modified rain ponchos. Beyond that there are bivy sacks. 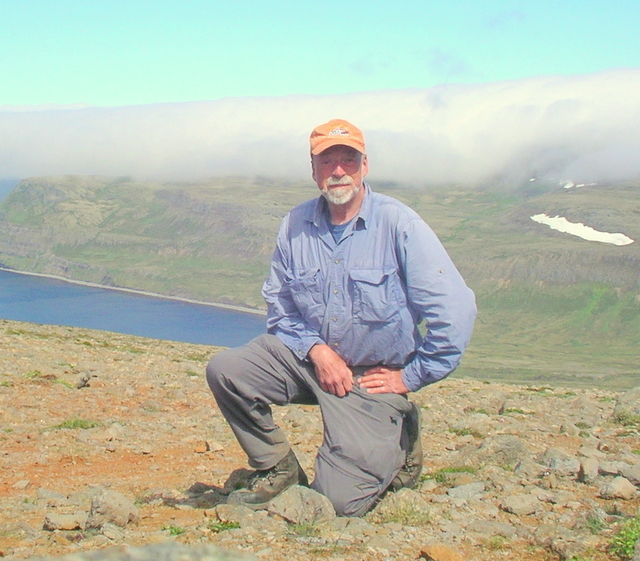 Three tents that I have used in recent seasons illustrate a range of tent choices as well as my search for the illusive “great balance” between weight, function and cost. I travel in a part of the world where rain and bugs happen. I like to have my stuff inside in these conditions and so prefer tents to bivy type solutions. Mountain tents, built to withstand really high winds and snow seem too heavy for general use. I have gravitated to solutions that are enhanced tarp tents, either modified or sewn from materials and a pattern. When I started backpacking again after a decade plus hiatus, To get a lightweight tent. I bought a share of a friend’s Big Agnes Seedhouse SL1 tent. It weighs 2 lbs. 8 oz. with another 11 oz. for stakes and ground cloth. 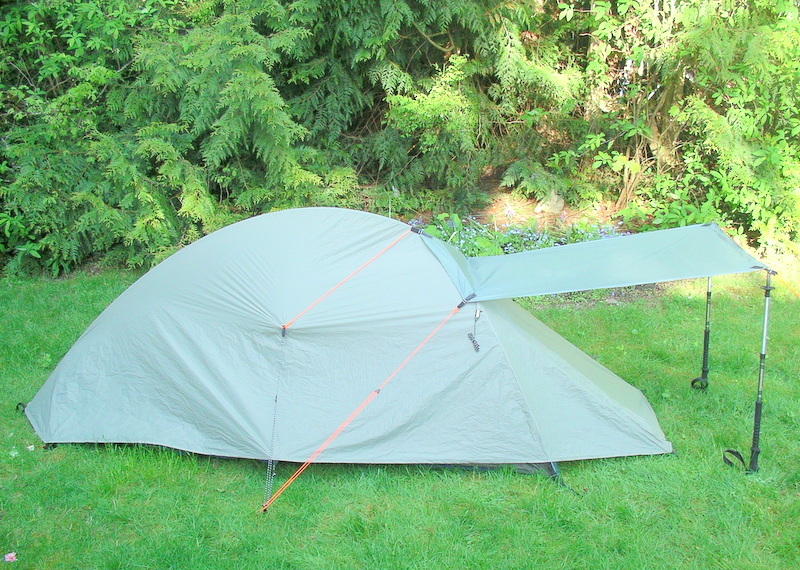 The Seedhouse is a typical modern, lightweight tent. It pitches on a tripod of flexible poles. There is an interior bug nest with a bathtub floor and an exterior fly. While it is a self supporting design, staking the fly out anchors the tent to the ground and maximizes interior volume. Inside dimensions are 90” total length by 43” width front and 31” rear for a total area of 22 sq.ft. Interior heights are 38” front and 16” rear. It’s a small tent and at 5’ 10”, I needed most of the tent length. I found ventilation difficult due to the slanting front door that opened above my head and let rain in. So I built an sil-nylon awning to pitch on trekking poles to allow me to sleep with the rain fly door open. I used it for my Iceland trip, but really wanted something else. To get more room without a weight penalty I moved on towards the world of enhanced tarp tents. These designs are variations of a tarp, pitched on trekking poles with provisions added to keep bugs out. I was attracted to a tent design available from several outdoor fabric suppliers. Living in the Pacific Northwest, I do business with Seattle Fabrics and bought the pattern and materials to make a Bilgy 2 tent. It is a sil-nylon tarp tent with integrated bug nest and bathtub floor. I choose the two person design as a reaction to the tight quarters experienced in the Big Agnes tent. I liked the big rain overhangs and the size delivered for the finished weight. 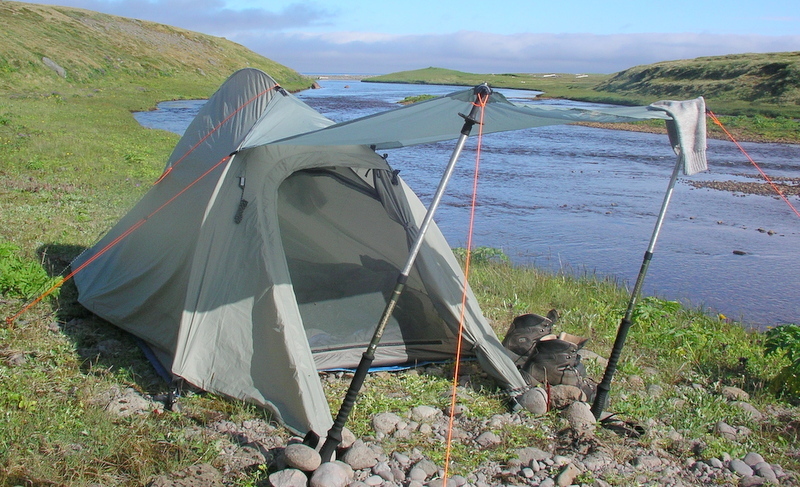 It pitches on trekking poles, like most ultra light tents. As I finished it, it weighs almost the same as the Big Agnes tent, 2 lbs. 8 oz. with another 8 oz for pegs and ground cloth. However inside dimensions are now rectangular, about 92” by 58”, for about 37 sq. ft. area. Interior heights are 45” front and 30” rear. My wife and I sleep comfortably in it with plenty of room for gear. It sheds rain well. My first night in it experienced a really heavy, extended rain that flooded the site, but water neither entered the tent floor or leaked through the roof. I did feel the infamous sil-nylon misting phenomenon, but nothing inside got wet. For kayak camping and couples backpacking, it is great. The drawback for solo comfort light packing is that the extended overhangs require a really big site for pitching. It is still a pretty nice tent and sewing it up from materials kept the price attractive as well. Since this tent has a bathtub floor, I experimented with a lighter weight ground cloth. I have been using a transparent poly-cryo film sheet. Mine is a 3M interior storm window kit film. I can get a 7’ x 9’ piece at a local hardware store for about $10. Cut to fit the Bilgy 2, it weighs just over 4 oz. It is totally waterproof, and I was surprised at its toughness. I haven’t worn out the first one yet. In alpine country, I get condensation forming on the inside of the tent on clear nights. I deal with this by having a small pack towel in the tent and use it to wipe down the inside surface before getting up. I don’t get drips, and the tent volume is enough that I don’t rub against the nylon during the night. But I was looking for a lighter solo tent. 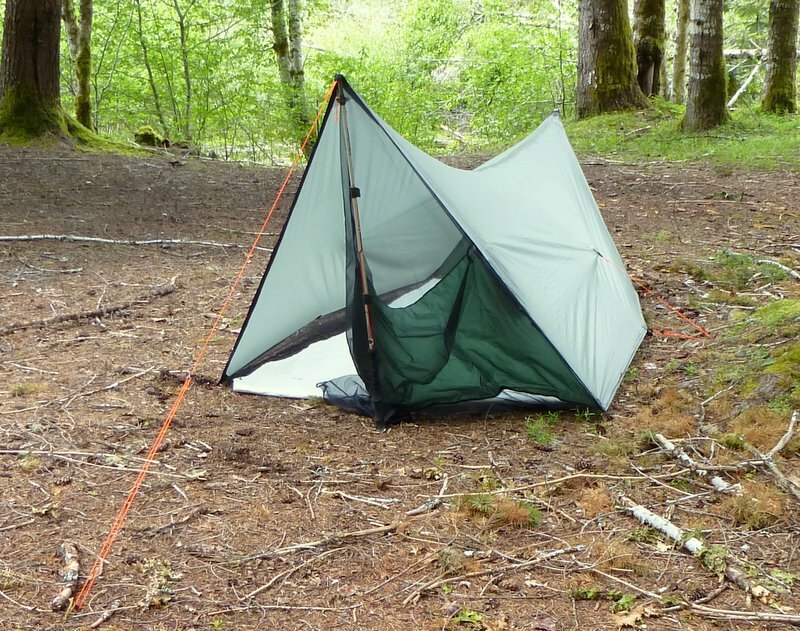 I came across a enhanced tarp tent design developed by Ron Moak of Six Moon Designs. He decided not to offer it as a product, but made the design public for individual use. He calls it the Night Wing. It is a catenary cut, A frame tarp design, but proportioned so that the ends overhang to give rain protection. The two ends are closed with netting, with a zippered door in the front end. Around the perimeter there is a netting skirt that provides a bug seal when the tent is pitched. I added a Tyvek floor/ground sheet that attaches to the four inside corners with bungie loops to keep it in place and flashes over the netting skirt to seal out bugs. Again it pitches on trekking poles. Again as finished in si-nylon, the tent, pegs and ground sheet weigh 1 lb. 14 oz. The inside dimensions are 88” long by 53” wide at the door and 38” at the far end, for about 30 sq. ft. area. Height at the door is about 45” and 30” at the foot. It pitches quickly and fits in a much smaller space than the Bilgy 2. Condensation issues are about the same as the Bilgy due to the single wall si-nylon construction and I solve them the same way. Experience sewing the Bilgy tent allowed me to add some Bilgy features to the Night Wing. At either end of the Bilgy tent, there are fabric panels that can be raised and secured with Velcro to block wind and driven rain. There are also interior mesh pockets on the wall. I added these features to the Night Wing as well as adding stakeout points to the side panels to increase the interior volume. I located a different grade to Tyvek cloth to use for the ground cloth/floor. It is Type 1443R and is often used by kite makers. It is about half way between standard building wrap Tyv ek and the very soft Tyvek used in protective clothing. It folds easily, is quiet and seems to be waterproof. I expect it will wear eventually, but so far it seems to work well. So far this is my grab and go tent for solo outings. This entry was posted in MYOG, Shelter and tagged Big Agnes, Bilgy tent, Night Wing tent, sil-nylon, tyvek. Bookmark the permalink.